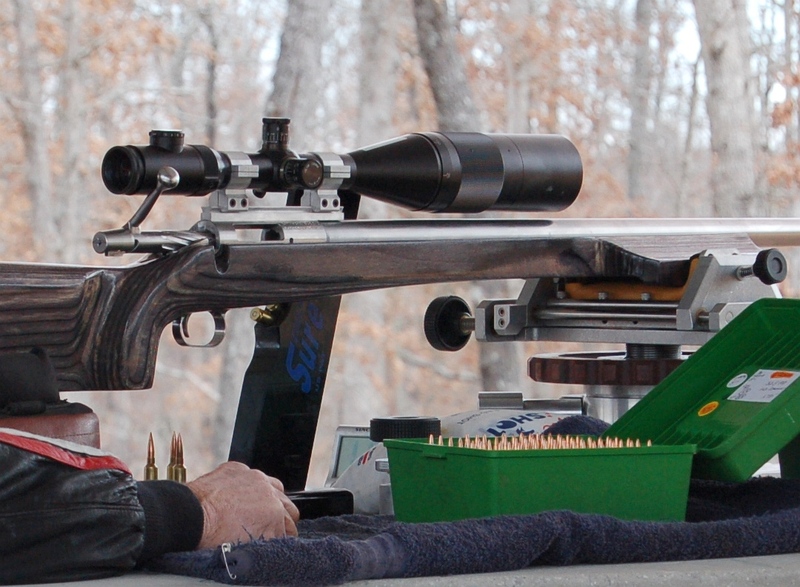 After we ran our Bulletin news item about Ron Boyd’s amazing 1.462″ 5-shot group at 1000 yards, many readers wanted to see some close-up photos of Ron’s rig. 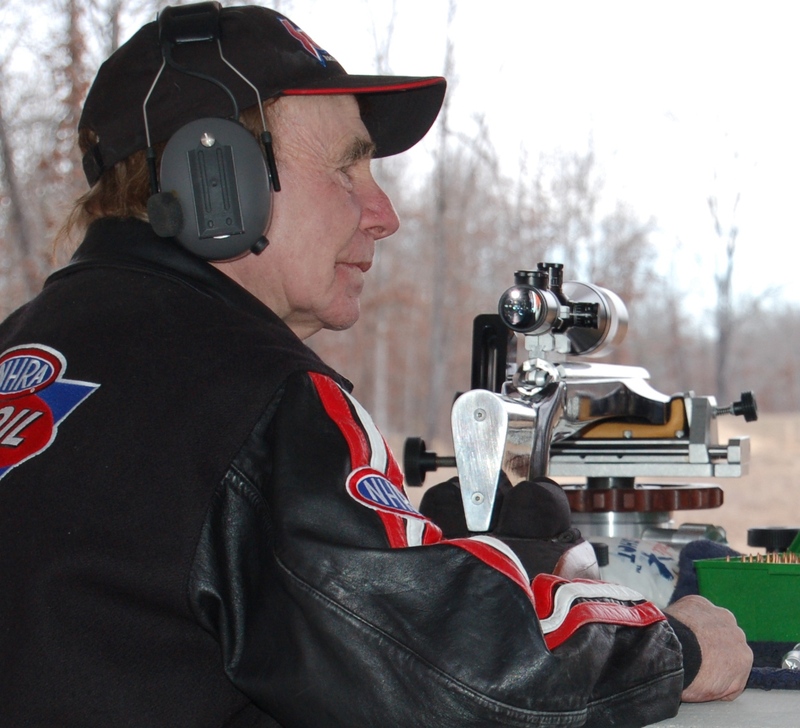 Thanks to Robert Ross of the MidWest Benchrest Club, we have some photos of Ron with his ultra-accurate 6mm Dasher 17-lb Light Gun. This rifle features a BAT SV action, Precision Rifle & Tool (PR&T) “Hammerhead stock” with 5″-wide front wings, Nightforce 12-42 Benchrest scope, and Jewell trigger. 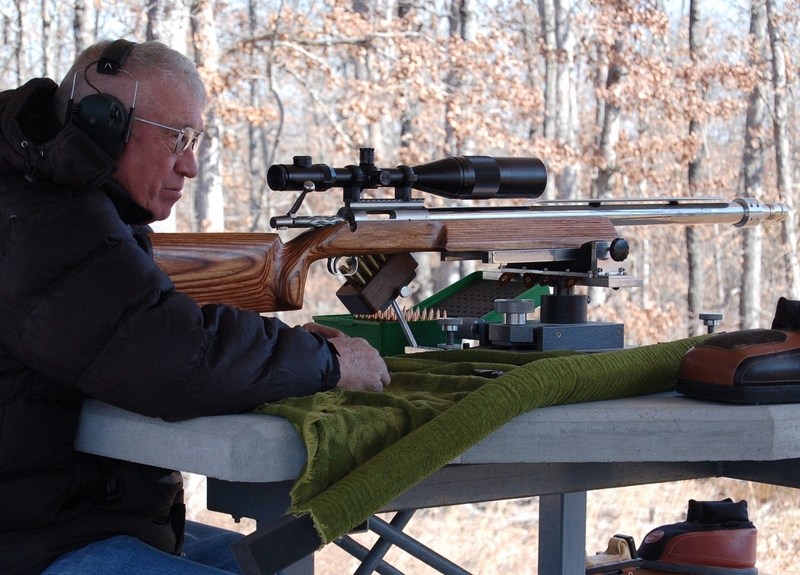 Ron had just added a 30″ 1:8″-twist Bartlein barrel to the gun before shooting the 1.462″ group. That barrel only had about 40 rounds through it when it produced the near-record group. The barrel in photos below was a 28″ Benchmark, recently replaced with the new Bartlein. Ron’s ultra-accurate 6 Dasher load consists of surplus Long Range Match powder, with Spencer 103gr bullets. Ron also anneals his Dasher brass after every firing. 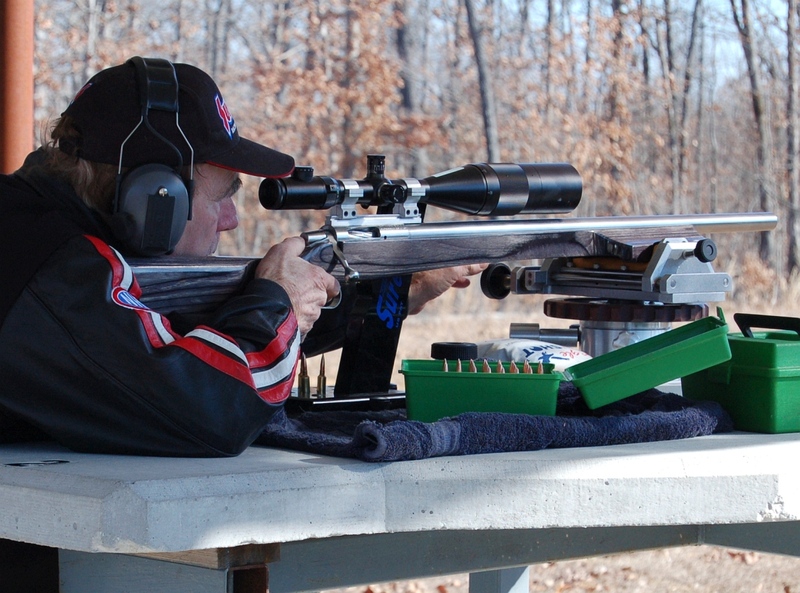 At the same Midwest Benchrest Club IBS match where Ron shot his small five-shot group, Henry Pasquet drilled a very impressive 3.348″ ten-shot group. This group was just .304″ off the IBS 10-shot Heavy Gun record of 3.044″ shot by Joel Pendergraft in 2009. We are told that Henry was running a straight .284 Winchester. You can see in the inset photos below that Henry uses a tuner on his barrel. He also has fitted an extra-wide front sled and a machined rear “keel” to reduce torque and improve tracking. Henry can adjust windage and elevation with BOTH his Fulghum front rest (from Randolph Machine) and his adjustable rear rest. Share the post "Spotlight: Ron Boyd’s Light Gun and Henry Pasquet’s Heavy Gun"
You have to love a gun company CEO who actually gets behind the trigger. In this “behind the scenes” video made during the filming of a Savage Arms commercial in Utah, Team Savage Captain Stan Pate guides Savage CEO Ron Coburn in the use of the Savage Palma rifle chambered in .308 Winchester. Despite the somewhat wobbly shooting platform, Ron successfully hits targets at 1200 yards. Ron comes away smiling, as do members of the film crew who get “trigger time” at the end of the video. The video has a very positive vibe and does a great job illustrating why it’s fun to shoot accurate rifles at long range. Hat’s off to Savage for putting its CEO behind the trigger. We love Stan Pate’s closing line. 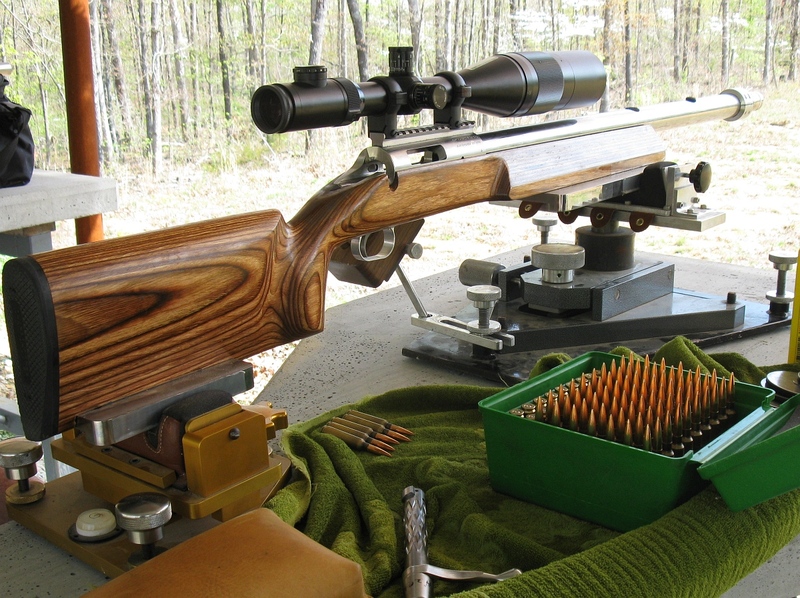 With a big grin, he says that the Savage rifle’s accuracy makes long-range shooting “So easy — even the Boss can do it“. Share the post "Long-Range Accuracy “So Easy — Even the Boss Can Do It”"